I guess you do not have to have a character commited to the story to acitvate this? 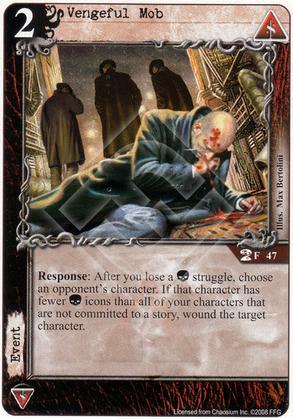 In that case it is a decent removal option for mono-Syndicate which generally has lots of high combat characters not commited to stories on the opponents turn. I think you're correct. Per the rules/FAQ, icon struggles resolve without opposition in favor of the active player. So if you have no characters committed to the story, you'll lose the © struggle. And there you go. (Likewise, if you lose but take no wounds because of invulnerability, it could still trigger this event.) The © icons for the player of the Vengeful Mob could be from exhausted characters, too. I hadn't ever thought this card through before; it's not half bad.